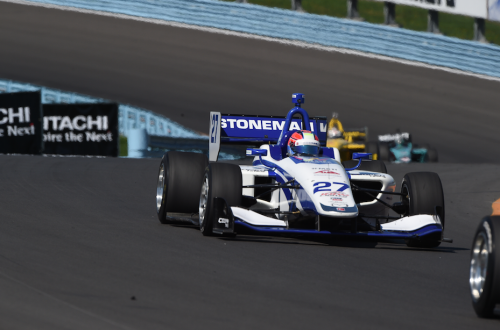 Indy Lights Presented by Cooper Tires, Watkins Glen, USA, 3rd September 2016 Dean Stoneman battled hard and had to overcome tyre issues to maintain his championship push at the historical ‘Glen track. The Andretti driver had a challenging qualifying as the team tried to find the right set-up for the fast flowing circuit which was proving to be demanding on the super reliable Cooper tyres. For the race, the rookie started from an unusual fourth row of the grid and made a solid start and moved up to 6th, a position he would hold for most of the 25 lap race. With five laps to go Stoneman began to put pressure on championship leader Urruitia for 5th place. The Uruguayan then suffered a huge blow-out and the Southampton based driver was up one place. From there Stoneman started to suffer issues of his own and was forced to pit with just 3-laps to go for new tyres to prevent falling to the same fate as Urruita. It was an inspired call by the team as Stoneman rejoined the race and produced the fastest lap of the race (1.346.10) and with it a further championship point on top of the twelve he received for 10th place. The Indy Lights championship reaches its finale next weekend at Leguna Seca, California. Dean remains third in the championship 196 points, just 23 points behind the lead.